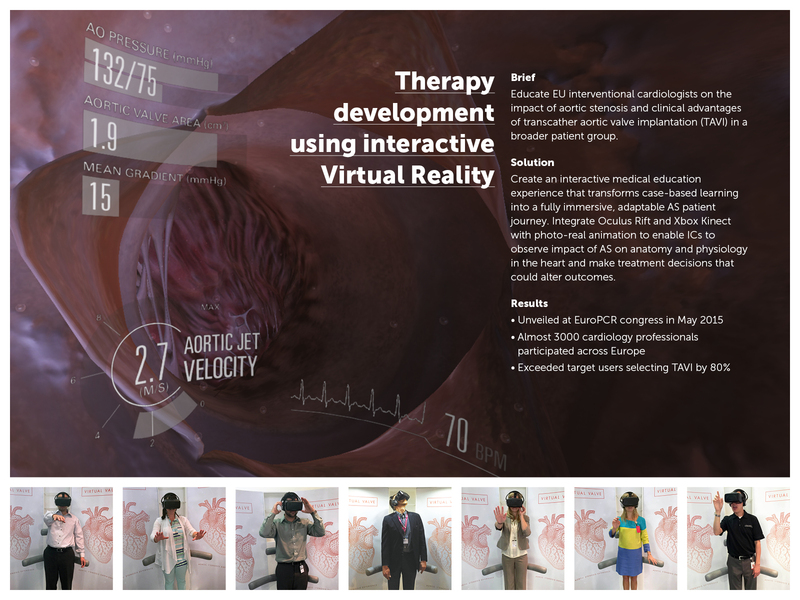 An educational tool for cardiologists uses virtual reality to raise awareness and explain a less-invasive procedure for treating aortic stenosis (AS) via exploration of a 3D visualisation of a heart. AS is the narrowing of the aortic valve in the heart, and is one of the most common valve diseases in the UK, affecting one in eight over-75s1. It is also one of the most serious. As the valve narrows, people can experience breathlessness, chest pain, fainting and heart palpitations. In cases of heart failure, AS dramatically reduces mortality. Currently, the gold standard for treating AS is valve replacement, which usually involves open-heart surgery. Unfortunately, this method carries with it the risk of complications, as well as visible scarring. A newer method is transcatheter aortic valve implantation (TAVI). Rather than needing to open the chest cavity, TAVI only requires a small incision in the groin, chest or shoulder. A replacement valve is then guided to the heart via an artery using a thin, flexible tube. Although TAVI is a safer alternative in AS patients with other complications, the procedure is underused because of poor understanding of TAVI among cardiologists. Because of the nature of AS, traditional 2D imagery isn’t enough to properly understand the disease’s extent. Therefore, only around 20% of AS patients eligible for TAVI are given the treatment. But what if, instead of using 2D imagery, a 3D system could be used? One that could engage cardiologists and give them an up-close view of the disease? A company that did exactly that was emotive, a London-based healthcare communications agency and its client Edwards Lifesciences. 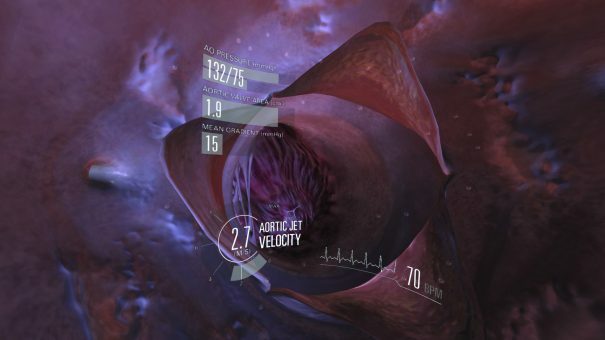 Using virtual reality as its core delivery platform, and with the help of expert cardiologists, the agency developed Virtual Valve – an educational tool for cardiologists to see cases of AS up close. 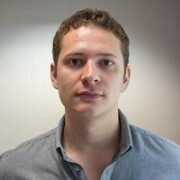 “We wanted to create something that let cardiologists actually see all of the intricacies of AS to let them make the most informed decision possible when deciding whether someone was eligible for TAVI,” explains Adam Boucher, Director of emotive. The Virtual Valve is a hyper-realistic, 3D recreation of a heart that lets cardiologists investigate patient heart health and even travel inside the organ. When viewing the heart, the user can experience the symptoms and co-morbidities of AS in real time and even change the disease severity to observe its impact on anatomy and physiology. The experience lasts around 10 minutes and takes the form of a case study, whereby the user is given relevant information about the patient’s health before being asked what treatment choice the user would typically make. Once the decision is made, the user manipulates the heart and investigates the impact of AS in each case. They then give their treatment choice at the end. The tool has proven a success in the cardiology world. It was launched at EuroPCR – the annual meeting of the European Association of Percutaneous Cardiovascular Interventions (EAPCI). From there, it has been showcased at more than 40 conferences in Europe alone and has been seen by around 3,000 cardiologists. One of those conferences was the European Society of Cardiology Congress in London, for which the agency sent out pre-event invitations to 50 interventional cardiologists to test the solution. Some of the many cardiologists enjoying the Virtual Valve experience. In total, 72 UK interventional cardiologists – including all of the 50 targeted – experienced the Virtual Valve. After that, TAVI was selected as the treatment choice in 70% of cases – much higher than emotive’s set target of 40%. “Many of our testers loved the device and feedback has been overwhelmingly positive,” says Boucher. For cardiologists – and many other surgeons – visualising inner organs is a static, 2D process. Typical methods, like CT and PET scans, although still highly effective means of visualising large areas of tissue, do not always provide smaller data related to more intricate structures like arteries. The severity of AS is a perfect example. At the same time, these scans provide a snapshot of organ activity instead of a recording activity over a period of time. As a result, many surgical decisions that include smaller structures may not be as informed as they could be, falling in line with guideline practice rather than on a case-by-case basis. The Virtual Valve solves this by better informing doctors not only on the physical state of a patient’s heart, but also on the effect AS is having on it, says Boucher. A similar technology could lend itself to many other conditions, resulting in more informed treatment decisions and potentially less money spent on further operations. And, of course, better treatment for patients. The Virtual Valve won a gold PM Society Digital Award in both the HCP Education and Support, and Digital Solution to Congress/Symposium and Meeting categories. It also won a silver in the Innovation category. Finalists for this year’s awards have now been announced. See them here. 1 Vuyisile Nkomo, Julius Gardin, Thomas Skelton, John Gottdiener, Christopher Scott, and Maurice Enriquez-Sarano. Burden of valvular heart diseases: a population-based study. The Lancet, 368:9540 (2006): p. 1005-1011.